BHHS is happy to report that the old Hollis High School has been saved from demolition after long preservation efforts by BHHS, CHARM and concerned citizens! It has been sold for rehabilitation into a "restaurant welcoming the public to share in a piece of Hollis history," said its new owners, who are looking forward to supporting local farmers, artisans and craftsmen. More to come on this subject as the process evolves! The old Hollis High School is located on the River Road across from Town Hall. 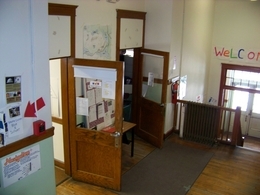 It has four separate classrooms upstairs, a small office above a half flight with two small windows in back. It has two classrooms downstairs with a cement floor, another divided room including a women's restroom,and another divided room, boiler room and men's restroom. It has a front and rear entry with split step entry. for a chemical laboratory, and a second room for...home economics. This was done by changing the size of the windows to provide for suitable lighting and raising the foundation." Provision was made for an assembly room with diving by a folding door to make 2 classrooms available in the future. A reduction in cost was made by omitting wardrobes from each room. The purchase of lockers in the basement at a later date was satisfactory. can be insured at a lower cost. Such a building is called a slow burning building and many fire hazards are eliminated..."
The sale of (town) timber made it possible to erect this building without greatly adding to the burden of the taxpayers..."
Built by contractors Googins and Clark." Educating its youth was a prominent goal of the colonists in Massachusetts as they began to structure their new social order. In 1642, a law was passed requiring parents and masters (of children who were apprenticed) to assure that their charges attained competency in reading and writing. The competency level was determined by the governing officials. The guiding philosophy for the law was that if everyone could read and understand the laws of the colony they would be better able to abide by them, and thus they would be better citizens. There was a strong religious element to this support for education, as being able to read the Bible was a primary educational goal. The law did have some enforcement power. The governing officials agreed that parents and masters should be the first line of instruction. However, if children were not meeting the competency criteria, the government retained the right to remove them from their homes and to place them in another setting where those needs could be met. In 1647 a new law was passed to help mitigate paternal neglect of education. Called the Old Deluder Satan Act, this law triggered the concept of formal schooling. Towns of fifty families were required to hire a schoolmaster specifically to teach reading and writing. Larger towns, those of a hundred families or more, were required to have a grammar schoolmaster (this term was borrowed from the English educational system they had left behind). The grammar schoolmaster was responsible for preparing the children to attend Harvard College (established in 1636). As the northeastern region prospered and its population grew throughout the next century, the educational system reflected its changing needs. Whole communities had relocated across the Atlantic. Although the majority of immigrants to New England were still from coming from England, other groups joined them, especially from Scotland. In order to prosper in America, these newcomers and their progeny had to learn skills that were demanded by the economics of this new and relatively untamed place. Agriculture, lumbering, boatbuilding, trade (import/export) and other commercial ventures were opened to people who had had little hope of advancement and prosperity in the countries they left behind. Schools served a vital function in channeling the tremendous energy to live successfully and well that America provided. Gradually the focus of education became based less on the European traditions of classical learning and theology. Schools responded by offering a more practically applied curriculum. Although the importance of religious education was lessened, it was still a vital part of the curriculum. Leaders such as Benjamin Franklin, who championed newly-discovered scientific theories and self-government, introduced students to new ideas. The concept of everyone obtaining at least a minimum general education was firmly established after the American Revolution. Social expectations changed as the new nation developed its independence and democratic self-rule. Even girls, who had been generally left behind in academic matters, were beginning to be included. During the 19th century various types of administrative bodies, curricula, funding mechanisms, and teacher training venues were tried and discarded. In spite of controversies in each of these areas, Maine citizens embraced the philosophy of the “common school” movement and established a system of a free elementary education, accessible to all, and paid for by public funds. When Maine separated from Massachusetts and became a state in 1820, 236 towns supported elementary schools. There were also 25 academies scattered throughout the state that were not supported by public taxation. As the century progressed, however, and as population increased to over a hundred families in each town (reaching back to that old 1647 provision), support grew for publicly funded schools beyond the elementary schools. “School age” included students from 5 -21 years old. By the 1890’s, Hollis was ready to entertain the idea of continuing publically funded education beyond the elementary school level, and in 1895 the town voted to fund a high school for one year, budgeted at $200.00 There were three nine-week sessions held in different locations: at Moderation Grammar School, at the Town House, and at Hollis Center. The town continued funding for this new educational opportunity, and after 1897 the high school remained permanently at the Town House. The curricula was rather flexible and students might skip a session. In his book The Rural Schools of Hollis, Maine, Dana Smith recounts the story of Luella Smith, who alternated high school sessions with teaching at the elementary schools. This plea was seconded with less rhetoric and more practical observations by the State Superintendent of Schools, who sternly enumerated multiple deficiencies, including lighting, heating, ventilation, limited classroom and laboratory space, and “very unsatisfactory sanitary arrangements.” Townspeople were inspired by these arguments to appropriate funds for a high school renovation project. Superintendent Louis J. West describes the successful renovations in the 1916 town report: “The pride of our buildings is the High School….” He reports that the high school had thirty students enrolled for this year. The renovations served the needs of high school students quite well until the 1930’s, when enrollment expanded, curricula needs became more diverse, and state regulations demanded greater accountability, especially academic standards. Keeping abreast of new educational demands in a rapidly changing economy meant adding vocational preparation to the more classically oriented studies. In 1938 the high school began offering a course in business training and started offering vocational guidance. Enrollment had doubled and staff increased from two to three teachers. By 1940 Superintendent of Schools George E. Jack expressed serious concerns about the overcrowded school, citing the enrollment, which had jumped from 53 students registered in the 1939 school year to 74 registered in the 1940 school year, with a freshman class of 33 students. The school was also in danger of losing its Class A rating after all those years of excellence. In 1941, therefore, in spite of the foreboding events in Europe, Hollis citizens placed their bets with the future and voted to build a new high school building. The building committee chosen to oversee its construction included Pliny Crockett, Charles Thomas, Sr., Ansel Hanson, Ralph Goff, and the Superintending School Committee. After many meetings, a standardized plan with some custom changes was approved. Everything about the building was planned frugally but not miserly. The committee demonstrated a thoughtful approach with consideration for quality materials and anticipation of future growth. One example of these considerations was brick construction, which mitigated fire hazards and lessened insurance costs. Maximum future use provisions allowed for a separate “chemical laboratory,” an extra room that might be used for home economics, and an assembly room that allowed flexibility by having a folding door divider. Just as thoughtful were equipment choices such as the decision to burn oil instead of soft coal (the upfront cost was greater but future savings would be realized by lesser janitor’s fees). In order to raise money for the building project, the frugal committee members sold timber from town farm property and realized $15,800.00 from the sale. They raised another $15,000.00 from the sale of bonds. The town also appropriated $6,200 from their regular budget. The building itself cost $19, 393.46, and its furnishings, equipment, well, landscaping, interior paint, and special window shades to control light totaled $17,565.83, for a final cost of $36,958.29. The new Hollis High School was proudly dedicated on October 17, 1942. The war years were difficult for many reasons, but particularly for small schools like Hollis because of a wide-spread teacher shortage and the resulting wage competition. In spite of this, Hollis High School maintained its standing and continued to employ teachers with excellent college credentials. One noticeable difference was a gender change. Girls were lucky to have been allowed even a grammar school education a hundred and fifty years prior to this. During the 19th century more girls attended “common school,” however, and there had always been a percentage who attended the private academies and, later, the public high school. These young women represented a majority of teachers at the grammar school level, although they were not paid as much as male teachers and they never served in an administrative capacity. Now, however, women became the backbone of the teaching staff at the secondary level. In 1947 even the principal was a woman, Marjorie Proctor. This appointment may have occurred because the high school had lost its entire teaching staff at the end of the prior year; Miss Proctor served only one year as principal. The question then, as now, revolved around salaries for teachers. Educational needs changed rapidly after WWII and into the 1950’s. A sense of urgency is found in Superintendent Jack’s explanations of changes required in the sciences and vocational educational course offerings. Expanding these areas required greater funding, in part because the low salaries offered to skilled teachers did not compete with the salaries they could command in the private sector. State regulations in areas of curriculum and teacher training standards improved accountability and helped to assure more even educational opportunities, but they also imposed some financial burdens, although these were mitigated in part by funding from the state general fund designed in particular to assist poorer towns. Hollis High School continued to maintain a high standard in spite of these challenges with courses added or revised in response to new requirements. The chemistry lab was improved; students were tuitioned to schools that provided vocational programs that the high school was too small to provide. Academically, students were tutored for college by their teachers, who devised intensive mathematics and science courses that met individual needs. In 1959, Hollis was a leader in teaching the new field of nuclear physics and “radiological defense,” using equipment that had been donated by the federal government. An athletic program and a music program had been successfully incorporated into the life of the high school. Hollis High students were also recognized by the National Honor Society and by participating in state wide spelling and speech contests. By the end of the fifties decade, as society and the educational system became more complex, the struggle to maintain a comprehensive educational program for an enrollment of sixty or seventy students was no longer viable. Consolidation with other area high schools became the compromise of choice. As has happened in so many other passages, the school administrative district is now left with an empty building that is no longer useful. They have scheduled it for demolition unless townspeople look again to create a new use. It is a handsome building architecturally. If we consider it in strictly practical terms it is easy to enumerate its many advantages: a sound structure, a good roof, beautiful new windows, a new heating plant, an excellent location in the town, large and light rooms. Many of us can imagine uses for all that space, uses that are now compromised in the Town of Hollis for lack of an adequate facility. There is another component to this building, though, that should give pause for consideration. Hollis High School is the only public building of historic value left in the town of Hollis. This building connects the town and its citizens back to our forefathers’ very earliest reason for fleeing to America and forming a free society. Its solid brick construction and graceful pillars, its situation on a central high point, on grounds that have served as a focal point for town business, social, and educational activity for generations, is a solid connection that bridges the change from the economics of agriculture to the economics of industry, business, and technology. It reminds us that our community of Hollis respects its past, serves its present, and prepares for its future. Annual Report of the Town of Hollis, Maine, 1910-11, p.43. Mr. West’s lengthy report in the Annual Repot Town of Hollis, Maine, 1916, is quite interesting and discusses not only buildings, curricula, and statistics, but also has some philosophical musings; it is fun to read. 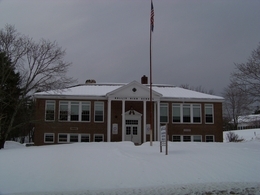 The basic plan used for the building was provided for by the Maine Department of Education. These plans had apparently been consigned by the department to assist towns as their schools expanded. The architectural firm responsible for the design was Bunker & Savage of Augusta, a firm which remains in business there. This observation does not detract from the historical importance of the two libraries at Salmon Falls and at Hollis Center, both of which have interesting and important stories of their own. 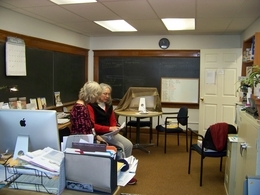 The libraries are public libraries and receive support from town revenues. These two buildings were both the result of generous private donations, however, and are not “public” buildings in the same sense as the Hollis High School building, which was wholly conceived and financed through the process of town government.